In the summer of 2014, ADI embarked on operation Spirit of Freedom to enforce Peru’s ban on wild animals in circuses. This is the biggest mission of its kind ever undertaken, and it has continued through 2015. ADI has tracked down and, together with Peru’s wildlife officials, raided circuses all over Peru. We have also taken animals from the illegal wildlife trade, in total rescuing approaching 100 animals. This project dates back to 2005, when ADI investigators started working inside the Latin American circus industry; they stayed two years. In 2007, we released our findings in several countries. Public and legislators across Latin America were shocked and calls for action catalyzed legislation to ban animal circuses in Bolivia, Ecuador, Peru, Paraguay, and Colombia - more recently followed by Panama, Mexico and others. Bolivia was the first to legislate, banning all animal performances in circuses, both wild and domestic species. The circuses were given a year to give up their animals. 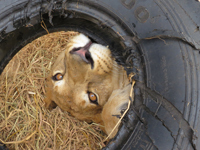 When time came for enforcement, ADI worked with Bolivian wildlife officials to enforce the law, raiding eight circuses and rescuing 29 lions, monkeys, horses and other animals. Similarly, in Peru and Colombia, we made the commitment to assist wildlife authorities to ensure their laws are enforced. Making good on our promise, in early 2014 ADI started planning the next steps with Peru’s wildlife officials from SERFOR (wildlife and environment policy) and ATFFS (enforcement and regulation), and the police. 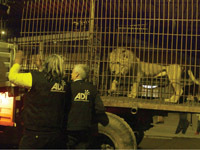 ADI would provide logistical support and animal handling while government officials enforced rules to eliminate the suffering of wild animals in travelling circuses. The first step was to establish the number of animals, species, ownership and identify the circuses while building a temporary place of safety for the animals. ADI investigators scoured Peru and located the circuses, at first finding five with 19 African lions, 2 tigers, and 2 monkeys. We knew there would be more and eventually found ten circuses. Our temporary rescue center needed the capacity to accommodate large jumps in animal numbers, and species. Peru’s zoos were already at capacity, with circus animals previously seized by the authorities. The search for a site for the ADI Spirit of Freedom Rescue Center involved surveys of multiple locations and we found our home in July. Our new home was an industrial unit used for growing crops, kindly donated by the owner for the duration of the rescue. A substrate of membrane and gravel was laid to protect the farmland and enable our trucks to manoeuvre; we built fencing and gates; refurbished a wall for secondary containment; and installed electricity, floodlights, security, alarms, plumbing, kitchens, refrigeration, food preparation; veterinary area; storage, tools, supplies, waste disposal and temporary holding units for primates and large cats. We were ready to receive our first animals by August 4th. The ADI modular holding units fit on the back of a truck so that lions can be loaded at the circus into the ADI cage, then on arrival at the rescue center, the holding cages are unloaded and joined to other units, which provides more space for each animal. We initially estimated that we would need at least 45 cages at $1,500 each before seizures could commence. Once ready, we made a presentation to government officials and police with our recommendations for enforcement. A 6-hour meeting concluded with a rescue plan and a list of target circuses and animals. Peru’s approach to enforcement was phased – interim regulations were introduced ahead of full enforcement in December 2014 – but officials wanted to start early as they were aware of blatant breaches of those regulations. Seizing animals early would also maximize the number of animals saved before they could be disposed of or killed by the circuses. However, it was going to be difficult. Seizure operations began with six ADI trucks loaded with cages heading out across Peru to the first four circuses to be raided. Some circuses were two days away, so it was important that the trucks left ahead to be in place before our teams arrived. We anticipated, correctly, that the first circus raided would immediately alert the others but calculated, again correctly, that the next circus would not expect us to be on their doorstep, hundreds of miles away, within 24 hours. 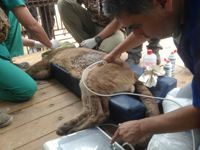 Huaral – 4 lions saved: In a difficult seizure we removed four lions but the circus retained three lionesses and only court action could secure them. We eventually got them in March 2015. We finished unloading the lions at the Spirit of Freedom Rescue Centre at midnight, got three hours sleep and left for a 5am flight to the next target at Ayacucho. Ayacucho – 2 lions saved: Another fractious seizure with no police crowd control; the ADI team had to coax the lions to move, surrounded by a mob of 60 circus people shouting, threatening and frightening the animals – probably the worst possible conditions for a transfer. Nevertheless, brothers Simba and Rey were removed and we embarked on a 19-hour journey over the Andes, 15,570ft above sea level, through rain, sleet and snow. Simba and Rey traveled well, their cages covered against the weather and snuggled up together in a bed of deep hay. The aggressive response from the circuses had shocked officials, so a seizure of two tigers was postponed (ADI eventually caught up with that circus in April 2015). After discussions about police support and procedures, officials next removed 6 lions and a monkey from a circus in Cusco.